District Recruitment 2018. Last to apply in a prescribed format for this Angul District Junior Teachers jobs is 31-05-2018. Candidates selection for this Jr Teachers jobs is based on their OTET score and interview. Application form is available for download at www.angul.nic.in website. Candidates must have qualified CT or B.Ed with OTET to apply these Junior Teachers jobs of Angul District SC/ST Development Schools. 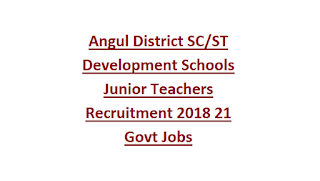 More information about this Junior Teacher recruitment of Angul District is given below. Last date to reach the filled application form to Angul District SC/ST Development is 31-05-2018. 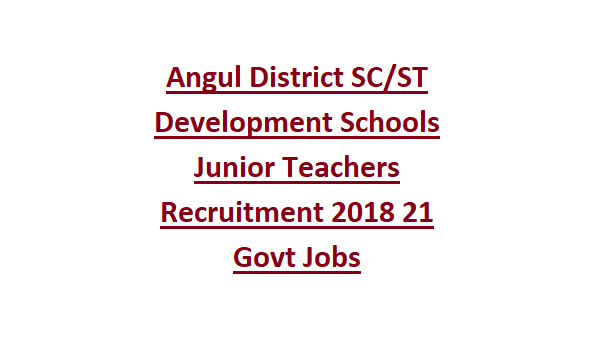 There are total 21 Junior Teacher posts in this Angul District SC/ST Schools recruitment 2018. The age limit is 18-35 years as on 01-01-2018 for general candidates and for others 18-40 years. B.Sc B.Ed or BA. B.Ed degree for applying this Junior Teacher jobs. Based on candidates score in OTET a shortlist will be prepared by selection committee. Those candidates only called for interview or documents verification and demo. Candidates can download application form from angul.nic.in website. And send the application form to "The SC/ST Development Section, Collectorate, Angul District" on or before 31-05-2018 along with all necessary documents.